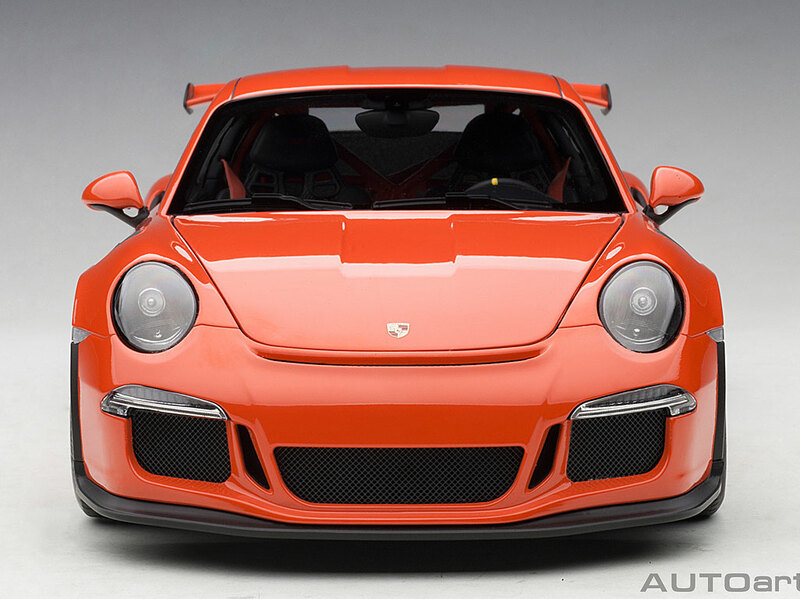 Porsche 911s are a dime a dozen in the real world, but the GT3 RS model is rare indeed, except the German automaker has been cranking out these race-ready models since 1999. That translates to about 14,000 of these high-priced babies rolling out of the Stuttgart plant’s doors. Autoart has created a snazzy street version model in 1/18 scale and lucky for us it’s bathed in a Lava Orange paint job. Yum! The GT3’s name is derived from the FIA Group GT3 class that this version of the 911 races in. But this model also runs the Porsche Supercup, the GT class in the American Le Mans Series, plus the 24 Hours of Daytona and the 24 Hours of Nurburgring, which it has won six times. The RS stands for RennSport, which means racing sport. Seems appropriate for a track-ready rumbler like this. The first RS was introduced in 1993, but the 991 version debuted in 2015 with the lastest RS being introduced this past February. The 2015 RS runs a 4.0-liter flat 6 with roughly 500 horsepower giving it a top speed of 193 mph. the latest revamp increased power a bit (513) and added 1 mph to the car’s top speed. Earlier this year the car set a lap time of 6:56.4 around the famous Nurburgring Nordscheleife in Germany. It’s the third Porsche model to eclipse the 7-minute mark at the track. That time was 24 seconds better than the earlier RS car’s time. For the record, the RS is reported to do 0-62 mph in 3.4 seconds, a full 0.6 seconds quicker than the previous model. 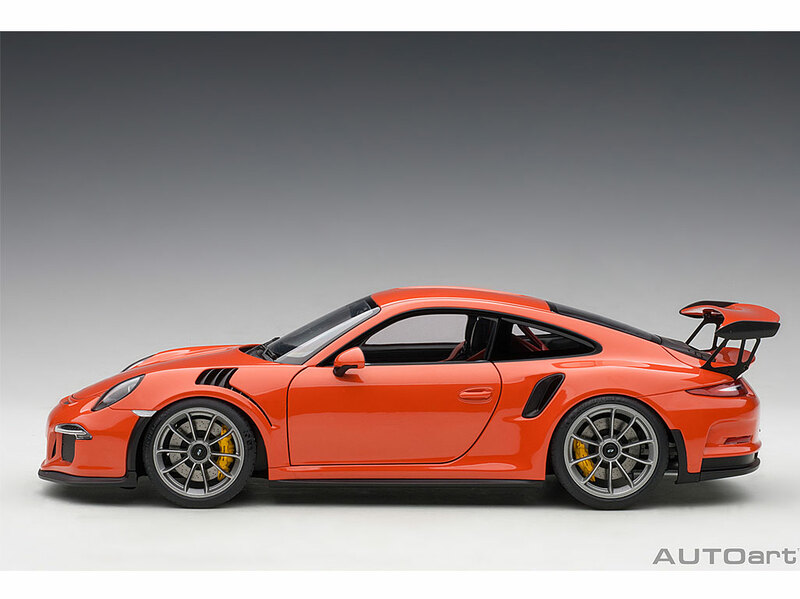 Other than speed, the GT3 RS features rear-axle steering and louvers over the wheels and air intakes on the rear fenders. This Lava Orange paint job is an eye-popper to be sure, plus this one features gray racing wheels with low-profile tires, RS-marked center caps, and yellow Porsche-labeled brake calipers behind those wheels. Oh, and did I mention giant drilled rotors? This looks like it means business. There are cool checkmark-shaped air vents on the front fenders to cool the brakes and fine black mesh screen over the large air intakes in the nose. Even a thin nose breather in front of the hood with mesh, nicely detailed. The car’s front projector-beam headlights look like they should blink on at any minute and the lenses are a smoky gray. Taillights also look realistic and you nearly expect to see a bit of exhaust out the twin black center-mounted exhaust pipes. In back is the big GT3 wing with black endplates and sculpted metal supports. Flip that up and there’s a carbon fiber-look fairing before the black mesh over that powerful flat 6 engine, with two turbo fans visible beneath and a GT3 RS 4.0 label atop the whole deal. Inside I like the black and orange bucket seats with matching orange fabric shoulder harnesses and black clasps. 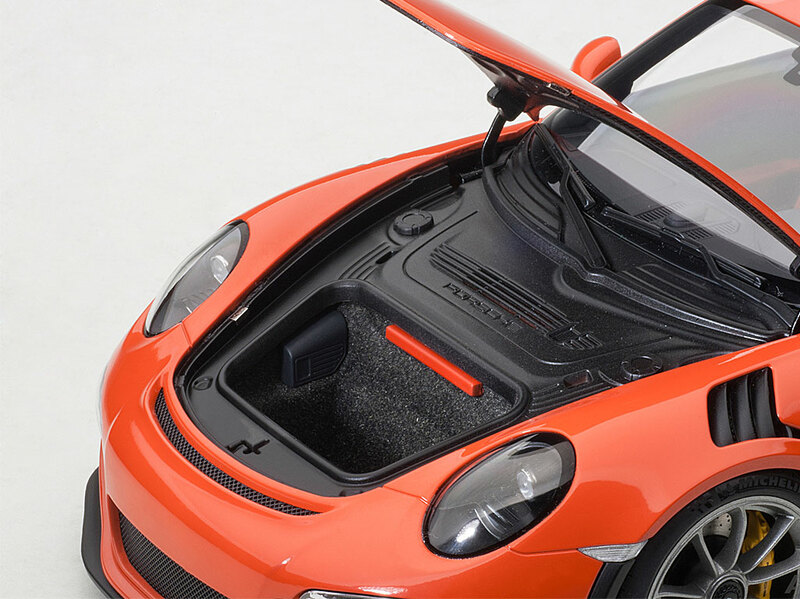 The Porsche’s bright orange roll bar stands out when you look through the racer’s large rear window too. The dash and console are extremely detailed from a bevy of dash gauges to the three-spoke racing steering wheel and thick console-mounted shifter that’s black and silver. Even the air vents look like they’re trimmed in matte chrome. Nice! A few other details of note, the mirrors have mirrored faces, there are side reflectors, well-executed door handles (they’re light weight here, naturally), a Porsche badge on the hood’s nose and GT3 RS in black script on the tail. I’m ready to fire this one up and hit the track. 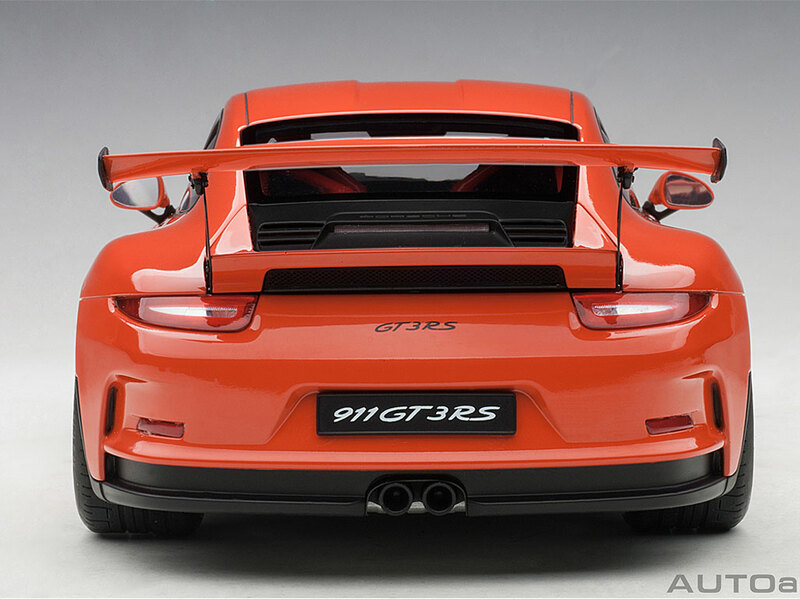 No other word for it, this street-version GT3 RS is a winner.